Please share this with others. It’s the most important human rights issue! Did you know it’s wrong to kill an unborn child according to California state law? You will be prosecuted for murder if you do (e.g. Scott Peterson). There’s only one exception: when a physician kills the child at the request of the mother. Doesn’t that seem odd? An unborn child is protected under the law like you and me. She is granted full human value. But in a moment’s request by her mother, an unborn child is transformed from a valuable human being into a valueless blob of tissue. She can be killed with impunity. This is bizarre, inconsistent, and sad. Imagine a hypothetical situation where a woman is pregnant with identical twin girls. Now suppose one of the twins is prematurely delivered at around the 25th week of pregnancy (typical pregnancies around last 40 weeks). The born twin is automatically protected under the law. Her sister still inside the womb, however, can be killed at any time during the remainder of her gestation. Although both girls are the same developmental age, one twin is safely protected outside the womb, while her sister is vulnerable inside the womb. The only difference between the twins is their location. Otherwise they are identical. But, as Francis Beckwith aptly recognizes, “Where one is has no bearing on who one is.” Our laws should not exclude members of the human community from legal protection simply because of their location. But that’s what is happening. I realize that some abortion-choice advocates argue that this inconsistency can be resolved by eliminating fetal homicide laws. But that’s the wrong solution because the science of embryology proves the unborn are human beings. Therefore, they should be protected. The solution would be to eliminate abortion-choice laws. That would protect all human beings, even those inside the womb. “The judgments of the Lord are more desirable than gold, yes, than much fine gold; sweeter also than honey and the drippings of the honeycomb” (Ps. 19:10). I have a friend who has a beautiful collection of rare Bibles. My favorite is one of the earliest printed copies, dating back to sixteenth-century England. The first time I held it in my hands I noticed that the top third of every page was covered with a dark stain. Tears filled my eyes when I realized it was from the blood of its original owner. My friend explained that when Bloody Mary ruled England, she delighted in terrorizing Protestants and murdering as many as she could. Her soldiers would execute their victims through some bloody means, then take his or her Bible and dip it into the blood. Some of those Bibles have been preserved and are known as Martyrs’ Bibles. Scientists have confirmed that the dark stains on every page of my friend’s Bible are, indeed, human blood. That same Bible is well worn from being studied. And many of its pages have water stains on them–perhaps from tears. Obviously it was someone’s most precious possession, and his or her blood is there to prove it. Psalm 19:10 captures the heart of such people, extolling the preciousness of God’s Word. To David, Scripture was more valuable than the best gold and purest honey. Meditating on it meant more to him than the richest and sweetest things in life. He knew its ability to satisfy every spiritual appetite. As precious as God’s Word is, many Christians take it for granted and become complacent in their studies. Some go for long periods without gaining fresh insights from its pages. This is the day that Martin Luther posted his 95 Theses on the door at Wittenberg! Here are some resources that will help you learn and remember how significant the Reformation was and still is. A video highlighting John Calvin’s impact. 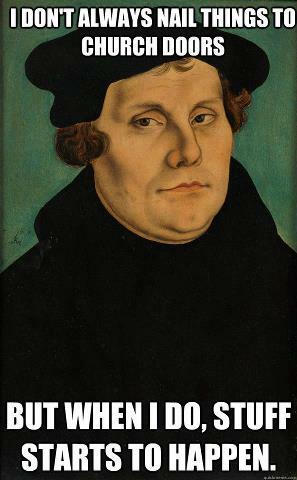 “Carl Trueman, writing against our tendency to romanticize Luther, remaking him in our own image, offers 9.5 theses about the man and why he might have a hard time fitting into the typical evangelical church.” Justin summarizes them here. Ligonier Ministries posts, In celebration of Reformation Day, we are offering the downloadable edition of R.C. Sproul’s recently released ten-part series, Luther and the Reformation, for free. This series introduces the life and thought of Luther while exploring the lessons we can learn today.” It is only good for today! Click here for downloadable Study guide as well. Here are two versions of the Reformation Polka–the theme song of October 31st!!!! Learn how the Reformation came late to some countries. The preaching and teaching and sacrifice that came with the European Reformation of the 16th century continues in many non-western countries today such as China. CrossWay Books is making The Joy of Calvinism available as a free downloadable ebook today only (many formats to chose from). Check back for more updates possibly throughout the day! View these pictures, weep, and pray for those severely affected by the destruction of Hurricane Sandy. Perfect satisfaction of divine justice! When the Lord Jesus Christ offered up Himself a sacrifice unto God the Father, and had our sins laid upon Him, He did give more perfect satisfaction unto Divine justice for our sins than if you, and I, and all of us had been damned in hell unto all eternity. For a creditor is more satisfied if his debt be paid him all down at once, than if it be paid by theweek. Are you walking deeply with God? The more deeply you walk with Christ, the hungrier you get for Christ . . . the more homesick you get for heaven . . . the more you want “all the fullness of God” . . . the more you want to be done with sin . . . the more you want the Bridegroom to come again . . . the more you want the Church revived and purified with the beauty of Jesus . . . the more you want a great awakening to God’s reality in the cities . . . the more you want to see the light of the gospel of the glory of Christ penetrate the darkness of all the unreached peoples of the world . . . the more you want to see false worldviews yield to the force of Truth . . . the more you want to see pain relieved and tears wiped away and death destroyed . . . the more you long for every wrong to be made right and the justice and grace of God to fill the earth like the waters cover the sea.